1924 May 15: Board renamed the school “General Mercer”. 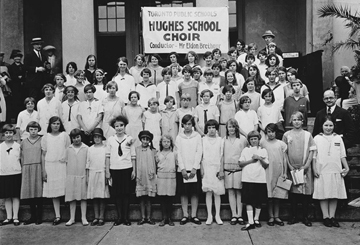 1924 May: Two classes of students marched from Hughes Public School and unofficially became the first pupils. 1924 June: 313 pupils transferred from Carleton School. Building erected 1923, with additions in 1926 and 1930. Dedicated to Major-General Malcolm Smith Mercer, born 1859, in Etobicoke, York County. He died June 1916, near Mount Sorrel, Belgium, while inspecting the trenches. GEN-PS-a: (WWII) “For King and Country” (illuminated list designed by A.J. Casson). Six columns. Surnames followed by given names. Red cross symbol is footnoted “Died on Active Service”. List does not specify which war, but date of school opening, presence of women’s names, and the use of an A.J. Casson document, indicate World War II. Runnymede School Section No. 9 (King George School—also in School Section No. 9—opened in 1912). 1909: Four-room school “for the northern students” opened on French Avenue, north of St. Clair Avenue West. The area called “Syme”—which is part of the Junction and Mount Dennis neighbourhoods—is named after George Syme, a Scot who emigrated to Canada with his family in 1862, and settled in the district in the 1870s. He bought 25 acres of gardening land in the Black Creek Valley (on the west side Jane Street; east side of Symes Road; north of St. Clair Avenue West; south of Black Creek River). A successful market gardener, Syme became wealthy. When he sold his property, he donated some of his land to York Township. The school bearing his name was built on part of this land. Syme was for many years a member of York Township Council, and one of the longest serving school trustees in Ontario. North Runnymede Methodist church and Sunday school services were held in the school until 1913, when the church’s basement was completed. 1917: Mount Dennis, School Section No. 28, overcrowded. Pupils of Harwood district, adjoining Weston Road South attended George Syme. 2009 May 2: Celebration of the 100th anniversary. GSY-PS-a: (WWII): A.J. Casson “For King and Country / Members / of George Syme School / who have volunteered for active service / with / Canada’s fighting forces.” Six columns. Surnames followed by given names. No key, but a stick-on blue star appears to indicate death. List does not specify which war, but presence of women’s names and the use of an A.J. Casson document indicate World War II. 1923: A six-room school opened in Mimico, a “railway town,” in the southeast corner of the former Township (later City) of Etobicoke. School was to serve students who lived north of the railroad tracks. Some pupils transferred from John English School, a few blocks to the south, which was becoming crowded. Named for Mimico’s town solicitor (1924-1964) who was also a former trustee, and superintendent of the nearby Victoria Industrial School (a boarding school for truant and delinquent boys) which later moved to Guelph. West entrance still (2008) shows “Girls” above doorway. Currell, Harvey. The Mimico Story. 2nd ed., rev. [Mimico, Ont.] Town of Mimico and Library Board, 1967. 170 pp. : ill., ports. Includes the honour rolls for both World Wars for the Town of Mimico, pp. 95-100. GRG-PS-a: (WWII) Illuminated list designed by A.J. Casson. “For King and Country / Members of / George R. Gauld School (letters fading) / who have volunteered for active service / with / Canada’s fighting forces.” Four columns. Given names followed by surnames. Names in random order. Column iv has one name only. No key. No deaths indicated. List does not specify which war, but date of school opening, presence of women’s names, and the use of an A.J. Casson document, indicate World War II. 1916 February: Classes first taught on site in portable classroom under principal of Norway School; 37 “mixed” pupils enrolled. 1916 June: Second portable classroom opened. Classes organized as Junior Third and Senior First. 1917 July 10: W.J. Farmery appointed as first principal. 1917 Sept: Classes moved into new schoolhouse with 179 public school and 116 kindergarten pupils enrolled. NOTE: Bronze plaque in memory of William J. Farmery, principal 1917-1934. GLE-PS-a: (WWII) “For King and Country” (illuminated list designed by A.J. Casson). Six columns. Given names followed by surnames. Names are listed under branch of service: Army, Navy, Air Force, etc. List does not specify which war, but date of school opening, presence of women’s names and some specific women’s divisions, and the use of an A.J. Casson document, indicate World War II. GLE-PS-b: (WWII) “For King and Country” (illuminated list designed by A.J. Casson). Four columns. Given names followed by surnames. Names are listed under branch of service: Army, Navy, Air Force, etc. List does not specify which war, but date of school opening, presence of women’s names and some specific women’s divisions, and the use of an A.J. Casson document, indicate World War II. This is the shorter list. Original building of eight rooms designed by Charles Hartnoll Bishop; 241 pupils registered. Additions in 1898 and 1908 made it a 17-room school. Old building demolished in the summer of 1962. New building occupied by September 4, 1962. School closed on or about June 30, 2000. Published history: Quinn, W.J. A Short history of Grace Street Public School, May, 1962. 3p. Note: Memorials are now at Charles G. Fraser, 79 Manning Avenue, M6J 2K6. 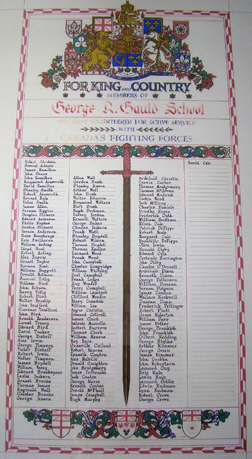 GRA-PS-a: (WWI) “Grace Street School Honour Roll of those who served their country in the Great War, 1914–1918”. Illuminated list, bordered with maple leaves “Designed by Leslie Victor Smith”. Four columns of names. Staff members and nursing sister’s names are first name followed by surname. All others are surnames followed by given names. Crown symbol appears to indicate death. Frederick Wortley’s name is on a separate card at the bottom of the list, inside the glass (presumably added after list was finished). GRA-PS-b: (WWII) A.J. Casson “For King and Country Members of Grace Street Public School who have volunteered for active service with Canada’s fighting forces.” Four columns of names. Red cross indicates “Killed in Action”. Surnames followed by given names. List does not specify which war, but presence of a World War I memorial, and the use of an A.J. Casson document, indicates World War II. GRA-PS-c: (WWI) Bronze plaque: 1914 – 1918, In loving memory of the boys of Grace St. School who gave their lives for humanity in the Great War. They died that honour and justice might live. (No names are listed). Location: 100 Grand Avenue, Etobicoke, Ontario M8Y 2Z3 (On the southwest corner of Grand Avenue and Dalesford Road) This is a “vanished” school—no physical traces of the building remain. It was south of the Queensway; north of the Gardiner Expressway; just west of Mimico Creek. The six-character postal code—a system gradually introduced across Canada beginning in April 1971—would not have been used at the time the school operated, but helps to pinpoint the approximate location of the school. A private residence now occupies 100 Grand Avenue (2014). NOTE: The first school in S.S. No. 11 was Humber Bay School, built in 1891, on High Street, east of Grand Avenue. Grand Avenue was probably built when enrolment increased at Humber Bay School, but local histories do not specify the reasons. 1924: School opened. Humber Bay school trustees had purchased property, west of Mimico Creek, from the Davidson estate. First principal: Miss M. Fear (remained until 1952). 1946: Etobicoke Board of Education was formed. One of the 14 school sections at the time was S.S. No. 11 Humber Bay. 1953: Municipality of Metropolitan Toronto formed. Etobicoke Board of Education became part of Metropolitan Toronto School Board system. 1977: Property sold. School was demolished “soon afterward,” though local histories do not give a date. Given, Robert A. Etobicoke Remembered. Toronto, Ont. : Pro Familia Publishing, 2007. Hall, Harry and Blanche (Gwilliam). Humber Bay: the Way We Were 1900-1950. (Cover title: Memories of a Place Called Humber Bay.)[Ontario][1991?] 136 p.: ill.
GRD-PS-a: (WWII): Illuminated list designed by A.J. Casson. “For King and Country / Members of / Grand Ave. School, Humber Bay, Ont. / who have volunteered for active service / with / Canada’s fighting forces. Four columns. Surnames followed by given names. Key: A red ink cross indicates “Killed in Action.” Memorial does not indicate which war, but the founding date of the school indicates World War II. 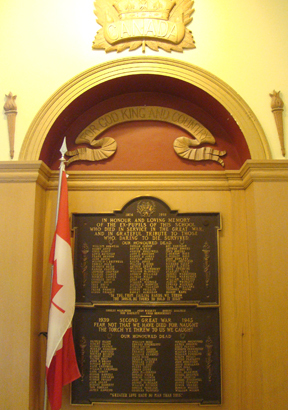 This memorial hangs in The Royal Canadian Legion, Sir Winston Spencer Churchill (Ont. No. 3) Branch, 150 Eighth Street, Etobicoke (New Toronto) Ontario. Our thanks to the Legion members, who kindly allowed access to the memorial. 1903 Jan and Feb: School closed for several weeks during severe diphtheria epidemic. Seven pupils died. 1903 Mar 25: H.J. Alexander of Vittoria appointed principal at salary of $550. H.E. Irwin, K.C., donated an organ in his honour. Women’s Christian Temperance Union and the Band of Hope, who met in the school, also used the organ. 1909: Severe measles epidemic closed school for several weeks; lost time regained during Easter holidays. 1912 Jan 3: Addition opened. During the building period, classes conducted in the Town Hall, the Methodist church, and the schoolroom of the Presbyterian church. 1995 Sept: Third school on original site opened. NOTE: no reference yet found when the name changed from King Street Public School to H.J. Alexander Public School. Published history: Cruickshank, F.D. and Nason, J. History of Weston. Weston, Ontario: The Times and Guide, 1937. Includes sketch of King Street School 1892; Honour Roll / Weston High and Public Schools / Great War: 1914–1918 (pp. 74–78) list includes all who served and deaths are noted. NOTE: The reference to “Junior Public School” indicates that the memorial is relatively modern. The name and founding date for Hartman Jones Memorial School are still visible above Westwood’s front door. Hartman Jones Memorial School was in the North Riverdale area of East York. North Riverdale stretches from Danforth Avenue on the north to Gerrard Street in the south; and between the Don Valley Parkway on the west and Pape Avenue on the east. The school was named for Hartman Jones, the first principal of William Burgess School, another East York school. The architect was Harry Dixon Martin (1877-1951). Mr. Martin also designed East York Collegiate and R.H. McGregor Public School. 1931 April: School opened for students. Cost: $190,000. 1931 Dec. 18: Commencement exercises held at St. Luke’s parish hall for 33 students who had passed the entrance exams. School trustee William Burgess handed out the diplomas. This A.J. Casson memorial now hangs at Chester School—a short distance north of the former Hartman Jones building. 1932 Sept: Registration was approximately 550 pupils. Todmorden Ratepayers’ Association met to discuss a 200-signature petition concerning the boundaries of Chester School and the new Hartman Jones Memorial School. Trustees were to consider the risks of younger students having to cross Broadview Avenue. The Board arranged for a motorcycle officer to oversee Broadview crossings. 1932: Oct 28: Official opening with “a golden key.” The widow of Hartman Jones declared the school open. The school choir sang. 2006 mid-Oct: Celebration of 75th anniversary. The school had probably been officially closed by this date. The school is not listed in the 2006-2007 Directory of the Toronto District School Board (the earliest available in our files). Some time after Hartman Jones Memorial School closed, the building was taken over by Westwood Middle School. The name “Hartman Jones” remained visible over the front entrance to Westwood. NOTE: The current (2016) school website for Westwood Middle School does not have historical information or dates. We welcome comments from anyone who remembers Hartman Jones Memorial School, particularly details of the school’s closing. HRT-PS-a: (WWII) Bronze (deaths only): To our glorious dead / 1939 (maple leaf) 1945 / In proud memory of / pupils of / Hartman Jones Memorial School / Who made the supreme sacrifice. Two columns; given names followed by surnames. (One name, Jules D. Baermaker, is centred below the two columns.) Their names liveth for evermore. This list of names is on a cairn-based flagpole memorial in front of Westwood Middle School, the former Hartman Jones building. NOTE: The surnames of Donald J. McAulay and Martin McAulay end with “ay” on this memorial, but on the A.J. Casson memorial—described below—both Donald J. and Martin appear with the spelling “McAuley. HRT-PS-b: (WWII) Illuminated list designed by A.J. Casson. “For King and Country / Members of / Hartman Jones Memorial School / who have volunteered for active service / with / Canada’s fighting forces.” Four columns. Surnames followed by given names. Key: red ink cross indicates “Died on active service.” A red circle indicates “Prisoner of War.” List does not specify which war, but the date of school opening, the presence of women’s names, and the use of an A.J. Casson document, indicate World War II. ca.1845: English immigrant John Davis arrived and soon opened Davis Pottery. He served as first postmaster (later established at what is now the corner of Yonge Street and Davisville Avenue) and funded the first public school in the area—Davisville Public School. 1860s: Property in this area (mostly owned by Davis family and their friends) was split. 1890: The Town of North Toronto was formed from the unincorporated villages of Davisville and Eglinton. 1912: The City of Toronto annexed the Town of North Toronto. 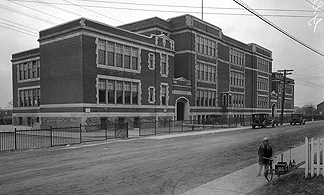 1915 Sept: Opened as Davisville East Public School with eight classrooms; 177 pupils. Principal: Miss Adda Burger. In late fall, school named Hodgson after W.W. Hodgson, chairman of the Board of Education that year. 1961: Senior school wing erected when the existing building was renovated. 1962: Senior wing formally opened. 2010–2012: School begins organizing materials for upcoming 100th anniversary. Among its documents is a “Record of Corporal Punishment” telling how many slaps were administered each time; only one girl’s name appears. Former students who died in WWII were listed on the school’s website, with links to other websites. 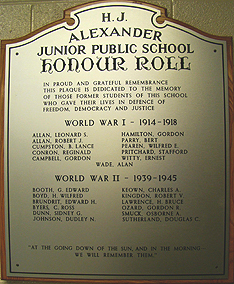 Web sites: The school’s website: http://schools.tdsb.on.ca/hodgson/ includes links to details of the lives of the former students who were killed during WWII, and whose names appear on their A.J. Casson memorial. HOD-PS-a: (WWII) (illuminated list designed by A.J. Casson). “For King and Country / Members of / Hodgson Public School / who have volunteered for active service / with / Canada’s fighting forces. Four columns. Surnames followed by given names or initials. Bottom of col. iv: eight names added after “W.” No explanation given for this placement. No key, but silver or gold stick-on stars appear to indicate death. Lower right-hand corner: Printed in Canada. List does not specify which war, but date of school opening, presence of women’s names, and the use of an A.J. Casson document, indicate World War II. NOTE: Among those who have a “symbol indicating death” is former Toronto Maple Leaf player, 20-year-old Dudley “Red” Garrett, one of 13 Toronto and district men who died November 1944 when a German U-boat torpedoed the H.M.C.S. Shawinigan near Newfoundland. All hands were lost. In 1947, the American Hockey League initiated the Dudley “Red” Garrett Memorial Award—later renamed the Dudley (Red) Garrett Award—which annually honours the top AHL rookie as voted by the media and players. Dudley Garret had played the 1942–43 season between the AHL’s Providence Reds and the NHL’s New York Rangers. Hodgson school is researching all students who died during the war. 1873 Feb. 19: John George Howard conveyed the school site to the trustees of School Section No. 22 (Brockton) York Township. 1875: School opened under Principal T.C. Lane. 1884: Brockton annexed to Toronto. 1884 May: Board records 32 pupils. 1889: Howard Street renamed Boustead Avenue; High Park became Howard Park Avenue. 1908: New four-room school was opened on Howard Park Avenue (one block north of the current Marmaduke Street address). 1908–1913: Three additions. At the time of replacement, the old school had 16 classrooms, three kindergartens, an exercise room, library, staff rooms, office and a health room. 1969 Sept 9: Construction began on new “open concept” school. 1970 May 22: Cornerstone laid. 1970 Sept. 8: School first occupied by students. 1971 Jan 20: Formally opened. HOW-PS-a: (WWI) Bronze plaque: 1914 – 1919 / Dedicated to the / Boys of Howard School / who gladly served / in the Great War / Pro rege et patria. (No names are listed). 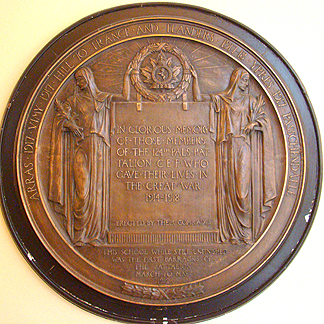 HOW-PS-b: (WWII) Bronze plaque: In honour / of the former members of / Howard Public School / who served the cause of liberty in / the Second Great War. / “to have served faithfully, is to have lived well.” (No names are listed). HOW-PS-c: (WWII) (illuminated list designed by A.J. Casson). “For King and Country / Members of / Howard Public School / who have volunteered for active service / with / Canada’s fighting forces.” Seven columns. Surnames followed by given names or initials. No key, but an inked cross in the left margin (beside some names) probably indicates death. Rough alphabetical order. Part of column vi and all of column vii is a separate list. There is no explanation for this placement; presumably these names were added later. List does not specify which war, but presence of women’s names and the use of an A.J. Casson document indicate World War II. 1912 Sept: Seventeen-room school opened with 286 pupils. Named for James Laughlin Hughes, LL.D., Chief Inspector of Schools for Toronto, 1874 – 1913. 1924 May: Two classes of students marched from Hughes Public School and unofficially became the first pupils at General Mercer Public School. HUG-PS-a: (WWII) (illuminated list designed by A.J. Casson). “For King and Country / Members of / Hughes Public School, Toronto / who have volunteered for active service / with / Canada’s fighting forces. Four columns. Surnames followed by given names or initials. List does not specify which war, but presence of women’s names and the use of an A.J. Casson document indicate World War II. Columns i-iv: Abbott, Donald to Price, F. No key. HUG-PS-b: (WWII) (illuminated list designed by A.J. Casson). “For King and Country / Members of / Hughes Public School / who have volunteered for active service / with / Canada’s fighting forces. Four columns. Surnames followed by given names or initials. List does not specify which war, but presence of women’s names and the use of an A.J. Casson document indicate World War II. No key. Columns i-ii: Price, Wm. to Yule, J.H. One out-of-order name (Stenhouse, A.H.) appears after Yule. Column iii has the heading: Staff (7 names). Surnames followed by given names or initials. Column iv has a main heading: Supreme Sacrifice; sub-headings: Navy (2 names); Army (4 names) Air Force (8 names). Surnames followed by given names. NOTE: By 2008, the two memorials for Hughes Public School (closed June 2000) were displayed at F.H. Miller Public School. Location: This is a “vanished” school—no physical traces of the building remain. On the west side of High Street, Etobicoke, Ontario—exact municipal address not found. High Street is a short (about 400 metres) dead-end street north of the Queensway; east of Park Lawn Road. It is the first street west of the Humber Sewage Treatment Plant. The third, 1923, Humber Bay School. Declining enrolment forced the school’s 1965 closing. The Humber River is one of the two major rivers on either side of Toronto—the Don River is on the east side; the Humber River is on the west. Both empty into Lake Ontario. Humber Bay, the mouth of the Humber River, is a large bay of Lake Ontario. At the top of a steep hill north east of the school’s site, are two rocks commemorating the 1615 visit to the area of Étienne Brûlé, believed to have been the first European to see Lake Ontario. Some historians now dispute the accuracy of this location. On April 27, 1813, fourteen armed American ships gathered in the bay before the burning of the Houses of Parliament in the Town of York (now Toronto). The neighbourhood of Humber Bay is roughly bounded on the east by the Humber River Valley; on the west by an area just west of Mimico Creek; on the north by Berry Road (earlier called College Street) and on the south by Lakeshore Boulevard West, which began as an old Indian trail on the north shore of Lake Ontario. In April 1881, businessman Joseph Davidson purchased five acres of land between Lakeshore Boulevard West and the Great Western Railway. He brought ready-built frame houses up from the United States, delivered in sections on his own barges across Lake Ontario. These were the first prefabricated houses in Ontario—perhaps in Canada. When Davidson died in 1901, Humber Bay had about 30 such houses which featured vertically-paneled outside walls; arched-top windows; no basements; no water. Artists, musicians, actors, and writers were early residents who gave the area a somewhat Bohemian flavor. Many painted their houses bright colours, and planted flowers all around. Two local brick yards, run by the Butwell and Price families, provided employment, as did the Carson Cement Block Factory. The area’s market gardens on lots of from two to 20 acres provided after-school, summer holiday, and permanent work for area young people. An early farmer’s market (at Park Lawn Road—originally called Salisbury Avenue— and the Queensway) started between 1915 and 1918. In 1946, property at 165 The Queensway was set aside for the Ontario Food Terminal. (Wartime shortages of building materials delayed its opening until 1954.) Beginning with the canoes of the First Nations people, the area attracted the building of a variety of water craft. In 1928, Hans Sachau a naval architect from North Germany, started a custom boat-building (sailboats, cruisers, and yachts) business on Lot 11, Lakeshore Road. During the Second World War, Sachau built Fairmile patrol ships for the Royal Canadian Navy, fins for Mosquito bombers, and designed rehabilitation devices for returning veterans. For decades, crowds of holiday makers from Toronto and farther afield enjoyed steamer excursions, sports, dining, dancing, and many outdoor activities in the summer months all around Humber Bay. 1888: One of Joseph Davidson’s prefabricated cottages on the west side of High Street —earlier called Frederica Street—was leased or purchased and turned into a school house. Until then, Humber Bay children had travelled west about two miles to attend school in Mimico. The annual salary for teacher John Douglas was $430. Approximately 35 children attended the first year. 1891: A two-storey, four-room brick school was built on the same property as the original school, facing Stephen Drive. Portables were added as enrolment increased. The principal’s annual salary was $400; teachers were paid $240. 1914–1918: During World War I, senior students wrote and published The Noisy Mansion News, featuring school and local news, and letters written by some of the local boys overseas. They also recorded students who had enlisted. 1922 July 30: War memorial (Great War deaths) dedicated. 1923: Plans for a Humber Bay library began. School rooms were at times used for a combined School Section and township–wide public library system over the years until a building (later a part of the Toronto Public Library) was built on Park Lawn Road. 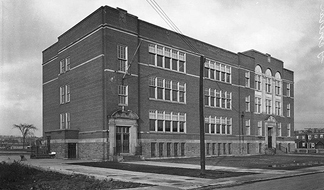 1924–1926: The “old school” building was used as a continuation school because of overcrowding at Mimico High School. Students took a four-year Junior Matriculation course. Building not demolished until 1949. NOTE: Carved in stone above the front window of this building was the name: Brûlé School. Members of Loyal Orange Lodge No. 920, who had a meeting hall just north of the school, and the Sons of England, who met in the Orange Hall, disapproved of Brûlé’s nationality, religion, and his reputed loose morals while living among various First Nations groups. The school was soon renamed Humber Bay. Later, the 1957 naming of a nearby school as “Étienne Brûlé” caused much amusement among residents with long memories. 1923: Built facing High Street. Six-room school with modern auditorium completed by local contractor, Robert Carson, who had attended the old school. The war memorial was moved here—its second location. 1946: Etobicoke Board of Education formed. One of the 14 School Sections at the time was S.S. No. 11 Humber Bay. 1965 June: Humber Bay became the first Etobicoke school to close because of declining enrolment. 1971–1979: The building housed the School of Experiential Education (SEE) an alternate school for grades, 11, 12, and 13. 1985 May 18: Reunion for the alumni of the 1930s held at Queensway Lions Club. More than 325 former students and spouses, ranging in age from 50 to 70 years of age, and some former teachers, attended. Cheque from the reunion was donated to Royal Canadian Legion, Branch 217 during their 1985 Remembrance Day ceremony. 1986: Building torn down to make way for housing development. Hall, Harry and Blanche (Gwilliam). Humber Bay: the Way We Were 1900–1950. (Cover title: Memories of a Place Called Humber Bay.)[Ontario][1991?] 136 p.: ill. NOTE: p. 63 lists the names of all who served in WWI; p. 54 has a labeled photo of the 1914 Home Guard. On pp. 64-65 is a list all who served in WWII. Photographs of some of the students who died in WWII are on pp. 66-67. A roll-up map was included with the book. http://humberbaysoldiers.blogspot.com/ By Michael Harrison. Includes information from WWI attestation papers; clippings; photos, etc. http://torontoplaques.com/ Under “Discovery Point” are photos and the wording of the rocks commemorating Étienne Brûlé’s visit to Humber Bay. NOTE: This cenotaph has had four locations. Men of Humber Bay held a fund-raising fair on the south side of the Queensway, where the Ontario Food Terminal now stands, to purchase a memorial to those who had died in the Great War. Dedicated on July 30, 1922 its first location was in front of the old school, inside—and to the right of—the school gates at Ringley Avenue and Stephen Drive. In 1924 or 1925, the memorial was moved to the front entrance of the new (1923) school, built (behind the old school) fronting on High Street. The memorial stood in the centre of a fenced-in garden. Students attended memorial services there every November. Club Brûlé raised money to pay for the inscriptions of the names of those who had died in the Second World War. That dedication service was held November 9, 1951 in front of the High Street school. When the school was sold in 1984, the memorial moved to the front of the Royal Canadian Legion, Branch 217, on Royal York Road, just south of the Queensway. Memorial services were held every year on the Sunday before Remembrance Day. When the Legion building was sold, the memorial moved to its current (2015) location at the Sir Winston Spencer Churchill No. 3 branch of the Royal Canadian Legion, 150 Eighth Street, New Toronto. NOTE: The memorial does not specify if all of those named on the memorial attended Humber Bay School, but a check of the names listed in the Hall book cited above, shows all to have been former Humber Bay School students. Six Grand Avenue School students, five of whom are listed in our Grand Avenue School entry, also appear on the Humber Bay list. There were eight school sections in Etobicoke (population 3,000) in 1850. School Section #5 Etobicoke was in the community known as Humbervale, between Royal York Road and the Humber River, south of Leggett Avenue. (Humbervale was never specifically identified on an Etobicoke map). The school was a consolidation of three earlier Etobicoke Township schools. 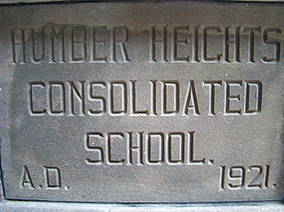 Opened in January 1922, Humber Heights Consolidated School was designed in the Georgian Revival style. The first principal was William (Billy) Burke. The one-storey brick structure was built on three acres purchased from the Fraser Farm, at the top of a hill, on the south side of Dufferin Street (now Lawrence Avenue), west of Scarlett Road. It had an entrance hall and auditorium flanked by six classrooms. In 1924, a two-room addition was added to the south. Students from Humbervale travelled to school by horse and wagon or sleigh, because they lived more than one mile away. In the early 1930s, trips to school were on the West York Bus Lines bus. The school served as a temporary morgue, health unit and emergency fire station following Hurricane Hazel in October 16, 1954. One Humber Heights student died. When the school closed in June 1982, the Etobicoke Board of Education used it for continuing education and archives storage, etc. It was replaced by a retirement home, Village of Humber Heights, which preserves some features of the original building. On June 7, 2008, there was a joint school reunion and official opening of phase II and III of the retirement home. Blumenson, John. Ontario Architecture. Toronto, Ont. : Fitzhenry and Whiteside, 1990. Cruickshank, F. D., and J. Nason. History of Weston. Weston, Ont. : The Times and Guide, 1937. Harrison, Michael. “Historical Schools in Etobicoke: Pre 1930”. Typescript prepared for the Etobicoke Historical Board/LACAC. August 1985. Given, Robert A., Etobicoke Remembered. Toronto, Ont. : Pro Familia Publishing, 2007. Hayes, Esther. Etobicoke. From Furrow to Borough. Etobicoke, Ont. : Borough of Etobicoke, 1974. “Humber Heights Says Goodbye”. Etobicoke Guardian (11 Nov 1981) 7. “Humber Heights School 60th Anniversary 1921-1981”. Typescript, 1981. Sauro, Silvio. A Celebration of Excellence. To commemorate the 25th Anniversary of the Amalgamation of the Etobicoke and Lakeshore District Board of Education 1967-1992. Etobicoke, Ont. : Etobicoke Board of Education, 1992. Sythes, Diana Clark. Humbervale: a Story of an Early Community in Etobicoke. Etobicoke, Ont. : Etobicoke Historical Board, 1995. NOTE: City of Toronto By-law No. 269-2002 (enacted April 18, 2002) contains a detailed description of the school and reasons for its designation as a heritage property. HHC-PS-a: (WWII) “For King and Country” (illuminated list designed by A.J. Casson) Wording at top of memorial reads: Residents of S.S. 5 Etobicoke. Surnames followed by given names. List does not specify which war, but date of school opening, presence of women’s names, and the use of an A.J. Casson document, indicate World War II. The memorial was dedicated at 8:30 p.m. on Sunday, May 7, 1944, in the school auditorium. The wooden frame, featuring a decorative carved “English rose,” was made by Albert Clark (father of Diana Clark Sythes who published a history of Humbervale in 1995). List compilers were (Mr.) E.O. Cathcart and (Mr.) H. Weller. Lettering was by Dorothy Fice. W.P. Graham provided the floral decorations for the ceremony. The memorial hung in the auditorium. After the school closed, it was kept for a time at the Army and Navy Club. In 2008, the memorial was held by the TDSB Archives, which lent it out for the combined school reunion and opening of the retirement home. Humbercrest Public School is in the northern end of the Baby Point area of the old Township (later Borough; then City) of York. Baby Point, a large promontory overlooking an oxbow in the Humber River, had been a Seneca village known as Teiaiagon, built in the 1660s or 1670s. The western boundary is the Humber River from south of Baby Point Crescent, north to St. Marks Road. The eastern boundary is Jane Street, south to Raymond Avenue. The area was named for the Hon. James (Jacques) Baby (1763-1833) a Quebec-educated Upper Canada judge and politician. (Residents pronounce their neighbourhood “Bobby” Point, reflecting the name’s French origins.) Baby family members lived at Baby Point until 1910, when the federal government acquired the land for a military barracks. When government plans changed, developer Robert Home Smith began a subdivision in 1913. Stone and mortar gates had been built to mark the entrance to the subdivision in 1911. The gates (corner of Jane and Annette Streets) were restored in 2011. In 2014, a cornerstone reading “S.S. 32 York 1915,” and entrances marked “Boys” (on the west side of the school) and “Girls” (on the east side) were still visible at Humbercrest school. 1916 Feb 26: Formal opening of eight-room school—the only school in School Section No. 32, York Township. Humbercrest was built to accommodate children living south of the railway tracks down to Bloor Street West, and from the Fifth Line (Jane Street) to the Humber River. Previously, many students had gone to Elizabeth Street School (Runnymede School Section No. 29). 1924: Four rooms and “a gymnasium for boys” added. 1924 Dec: Humbercrest (originally Baby Point) Methodist Church opened. For some years the congregation had held services in the school. 1933: A township public school board replaced the old “School Section” system. 1936: The Public School Board and Collegiate Institute Board united to form an 11-member York Township Board of Education. 1998 Jan 1: The City of York was one of six municipalities that merged to form the City of Toronto. 2013 Sept: A new addition, started in April, opened. 2015 Sept 25 and Sept 26: Celebration of 100th anniversary. Some activities planned for a traditional “fall fair” theme: a parade of Humbercrest alumni; children’s concert; decades rooms; dance at historic Lambton House (on the east side of the Humber River; opened 1848). Boylen, J.C. York Township, An historical summary. Municipal Corporation of the Township of York. York Township, 1954. Thomas, Wilbert G. The Legacy of York: (a survey of the early development of the communities of York). York, Ontario: Historical Committee of the City of York, c1992. 96 p. See: The District of Baby Point pp. 5-13. HMB-PS-a: (WWI) Bronze plaque: In proud and honored memory of the men of / this school section who died for their country / 1914-1918. Two columns; four names in each column. Below the names: This tablet was erected by the trustees / of School Section 32, York Township. HMB-PS-b: (WWII) Illuminated list designed by A.J. Casson. “For King and Country / Members of / Humbercrest Public School / who have volunteered for active service / with Canada’s fighting forces.” Six columns. Surnames followed by given names. No key. List does not specify which war, but the presence of a separate WWI memorial, women’s names, and the use of an A.J. Casson document indicate World War II. Humewood neighbourhood takes its name from Humewood House, a 25-acre estate built about 1858 by influential Irish immigrants William Hume Blake (1809-1870) and Catherine Honoria (Hume) Blake (1804/5-1886). The ancestral home of both—they were first cousins—was Humewood Castle in County Wicklow. Toronto architects Cumberland and Storm included a conservatory and bowling alley in the design. A six-foot high fence surrounded the house, which was approached through impressive gates opposite today’s Christie Street. Realizing they were not suited to pioneer life in Middlesex County, the couple had moved from near Strathroy to Toronto, where William studied law. Catherine operated a private girls’ school to supplement their income. Called to the bar in 1838, Blake was politically active and a highly successful lawyer. He was crown attorney in the murder trial of Grace Marks—the story told in Margaret Atwood’s novel, Alias Grace. One son, Edward Blake, became Premier of Ontario. Humewood was sold in the 1870s. In the 1880s, fire damage led to rebuilding. The estate property shrank as lots were sold, but in 1912, when St. Thomas’s Anglican Church bought the house as a home for unwed mothers, more than two acres supported an orchard, vegetable garden, and space for 100 chickens. Humewood House observed its 100th anniversary in 2012, erecting a sign that reads: Resource Centre for Young Pregnant Parenting Women. The lane leading to the original house (now rebuilt) is today’s Humewood Drive. The neighbourhood is often “twinned” as Humewood-Cedarvale. The boundaries are: on the south, St. Clair Avenue West; on the north, Eglinton Avenue West; on the east, Bathurst Street; on the west Oakwood Avenue (formerly Lake View Avenue). Cedarvale is in the northeast portion above Vaughan Road, which runs diagonally—dropping down from west to east to avoid crossing Cedarvale Ravine. Humewood is in the southwest portion below Vaughan Road. Humewood is sometimes referred to as “the woods,” as many street names end in “wood.” The two areas are also partly separated by Cedarvale Ravine. 1914: Humewood, an eleven-room school designed by architect Charles Hartnoll Bishop, opened on Maplewood Avenue, below Vaughan Road, just north of St. Clair Avenue West. Although then in the Township of York, it was built by the Toronto Board of Education, expecting annexation of the area north of St. Clair Avenue West. (That annexation did not happen.) Humewood was the first school in the area. Cedarvale did not get a school until J.R. Wilcox was built in 1920. Before Humewood was built, students went outside the area for education. 1924: The Township of York bought Humewood School from the Toronto Board of Education for their School Section No. 25. Price: $145,000. 1925: Six rooms added to Humewood, which still appeared in York Township records as S.S. No. 25. 1928: Six more rooms added to Humewood (S.S. No. 25). 1930: Six more rooms and a gymnasium added to Humewood. 1933: School sections replaced by a township public school board—an action strengthened by the difficulties of the Depression. Regular meetings of the new board to be held at York Memorial Collegiate Institute. 1936: Collegiate Institute Board and Public School Board united to form the township Board of Education. Legislative grants to continue on the same basis as with the school sections. 1972: New Humewood school built at 15 Cherrywood Avenue. (The old school had been on Maplewood, on the hill.) Some stained glass depictions of scenes of childhood—a boy fishing; a boy flying a kite, etc.—were transferred to the new school. Boylen, J.C. York Township: an Historical Summary 1850—1954. [Toronto] : The Municipal Corporation of the Township of York and The Board of Education of the Township of York, 1954. 131 p. : ill. Appendix B: Collegiate Institute Boards; Public School Boards. Appendix C: School Construction in York Township. Thomas, Wilbert G. The Legacy of York: a Survey of the Early Development of the Communities of York. (York, Ont. : Historical Committee of the City of York, c1992] 96 p. : ill.
1902: Began under Public School Board of West Toronto, in “Toronto Junction,” a suburb of Toronto. Opened as Western Avenue School, a branch of Annette School, under Principal Wilson. Two classes, with assistant teachers, Miss M.E. Cherry and Miss Rachel Barnes. Two-storey; four rooms, with basement. 1903: School got its own principal. 1909: West Toronto annexed to Toronto. By May, school had 410 pupils; additional accommodation found in nearby churches and stores. 1913: South wing added, including provision for a kindergarten. 1914: North wing (four rooms) added. 1965 Jan 4: New school first occupied by students. Old building (demolished 1965) had contained 11 classrooms, one special education room, a library and a kindergarten. IND-PS-a: (WWII) (illuminated list designed by A.J. Casson). “For King and Country / Members of / Indian Road Crescent School / who have volunteered for active service / with / Canada’s fighting forces. Four columns. Surnames followed by given names or initials. Sub-headings: Army; Air Force; Navy. Key: Silver stick-on star indicates “Killed.” Red stick-on star indicates “Wounded.” Green stick-on star indicates “Prisoner of war.” Grey stick-on star indicates “Missing.” List does not specify which war, but presence of an air force list, women’s names, and the use of an A.J. Casson document indicate World War II. No World War I memorial found. ca. 1832: No Board records found as to the exact founding date. Tradition says the school originally opened at the corner of McMurrich and Davenport between 1832 and 1845. 1858 Sept. 29: Formal opening. School eventually grew to at least 12 rooms. 1950: By this time, Jesse Ketchum school had 10 “Sight Saving” classes; also, six teachers to handle 424 pupils in night classes. Published history: Jesse Ketchum School, 150 years. Toronto: Toronto Board of Education, c1982. 8 p. illus. JES-PS-b: (WWI) Bronze plaque (maple leaf in each corner): The Great / War / 1914-1918 / This school building / was the Canadian home / of the / 124th 170th and 216th Battalions / of the / Canadian Expeditionary Force / and of the / Royal Air Force. / From within these walls six thousand / men went to battle overseas, that / freedom and justice might prevail. / Erected by the Board of Education of / the City of Toronto. / God Save the King. JES-PS-c: (WWI) Bronze plaque with crossed flags (Union Jack and Red Ensign) and beaver: 1914 1918 / In honour and loving memory / of the ex-pupils of this school / who died in service in the Great War: / and in grateful tribute to those / who, daring to die, survived. / Our honoured dead. After the list of names (three columns; first names followed by surnames): “To you, from falling hands, we throw / the torch: be yours to hold it high.” Included on this list is Norman Bethune (1889-1939). Although most biographies do not mention his attendance at Jesse Ketchum, John Robert Colombo reports that Bethune “graduated from Jesse Ketchum Public School in Toronto and from Owen Sound Collegiate Institute.” (Ref. Canadian Literary Landmarks, v.20; 335. p.120 (under “Gravenhurst”). John Robert Colombo. Willowdale, Ont. : Hounslow Press, c1984.) Norman Bethune, “medical student,” gave his own and his father’s address on his First World War attestation papers as 19 Harbord Street, Toronto. NOTE: Under an arched alcove are: two bronze plaques (JES-PS-c, JES-PS-d) one for each world war. Above the alcove is a large wooden crown (with “Canada” at the base) superimposed on a maple leaf. Above the two plaques, a wooden banner “For God King and Country”; a wooden torch on each side of the alcove. NOTE: Pals Battalions arose through special local recruiting drives. The volunteers would join, train, travel, and serve as soldiers with friends; neighbours; relatives; workmates; and colleagues (their “pals”) rather than be mixed in with the regular soldiers. The idea was to give a feeling of comradeship that would increase enlistment. When dramatic death tolls occurred in these close-knit groups, officials realized the drawbacks and discontinued the practice. 1838: List of teachers stated that Patrick Rock was teaching 32 pupils on Lot 9, Concession 2 (possibly Royal York Road at the Queensway). A school was shown here on William Hawkins’ 1834 plan of the King’s Mill Reserve. 1850: Township of Etobicoke divided into eight school sections. Mimico was included in school section No. 1 (the area between the Humber River and Etobicoke Creek; almost as far north as Dundas Street). Log building (probably rented) stood on the west side of Church Street (now Royal York Road) possibly at the Queensway. Second school was a frame building on the west side of Church Street, opposite what is now Mimico Avenue. William and Helen Arthurs had donated this site to the Home District in 1846. 1884: Third school was a one room-brick building on the northeast corner of Mimico Avenue and Royal York Road; the site of the present John English school. Walter Burgess, school trustee, presented a clock to the school. 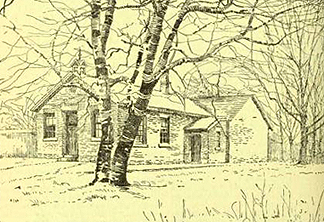 1893: Third school demolished; replaced with three-room brick building on the same site. 1905: Mimico became a police village. 1911: Village of Mimico incorporated; withdrew from Etobicoke Township. First Mimico Public School Board formed. 1915: Four rooms added; school grounds enlarged. 1917: Mimico became a town. 1921: Until this time, Mimico depended upon Toronto’s Parkdale Collegiate for secondary education. Mimico trustees established Mimico Continuation School for the first grades of high school, using part of the public school building. E. H. Glenn, a WWI veteran, was principal of the combined public and continuation school. 1923: Mimico High School Board formed. 1924: Eight-room Mimico High School built. 1925: Mimico Public School renamed John English after a former principal. 1932: Four rooms added to John English. 1940: Mimico Board of Education established. 1951: Mimico joins Lakeshore District Board. 1954: John English School replaced. The new two-storey brick building reached to Elizabeth Street. It had oak paneling, ornate moulding, and a grand central staircase (with oak banister) where at Christmas, classes lined up to sing carols with song sheets. The ceilings were ornamental plaster set in a square pattern. Separate playgrounds for boys and girls had a wood fence between them. Charles King, caretaker for 44 years, lived in a small house on the Elizabeth Street end of the property. 1956: Old John English School torn down. 1967: Mimico joined Etobicoke Board. NOTE: Details of the school’s early history vary according to sources used. Researchers should consult the publications listed below. Berry, Susan. A history of Education in the Lakeshore Area: Mimico, New Toronto, Long Branch. Toronto: Wylie Press, [1966?] “A souvenir publication from the Lakeshore Board of Education.” Unpaged. Sauro, Silvio. A Celebration of Excellence: to Commemorate the 25th Anniversary of the Etobicoke and Lakeshore District Boards of Education 1967-1992: and the Dissolution of the Etobicoke Board of Education May, 1947-December, 1997. Etobicoke, Ont. : The Board of Education for the City of Etobicoke. rev. 2nd ed. 1997. 135 p. ill. Appendices. Appendix E: Chronology of Educational Developments in the School Sections. Appendix F: Important Dates in the Governance of Etobicoke Public Education. JNE-PS-a: (WWII): Illuminated list designed by A.J. Casson. “For King and Country / Members of / John English School / who have volunteered for active service / with / Canada’s fighting forces.” Six columns. Surnames (A-P) followed by given names or initials. List does not specify which war, but presence of women’s names, and the use of an A.J. Casson document, indicate World War II. NOTE: Flight-Lieutenant David Hornell, Victoria Cross recipient, who died in 1944, is on this list. In 1961, an Etobicoke elementary school was named after him. JNE-PS-b: (WWII): Illuminated list designed by A.J. Casson. 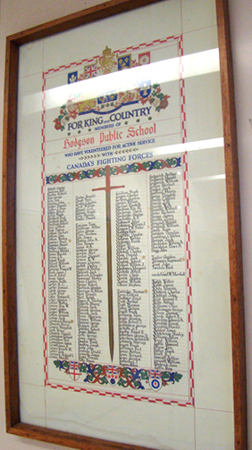 “For King and Country / Members of / John English Public School, Mimico / who have volunteered for active service / with / Canada’s fighting forces.” Two columns of names. Surnames (R-W) followed by given names or initials. List does not specify which war, but presence of women’s names, and the use of an A.J. Casson document, indicate World War II. NOTE: The (A-P) memorial is headed “John English School.” The (R-W) memorial is headed “John English Public School, Mimico.” Also, both memorials have decorative calligrapher’s space markers. 1926 Feb 11: Township of York Board decided “the new school to be erected on the Fairlawn Avenue site be named the John Wanless School.” Wanless was a Township of York council member 1903 – 1905; a Toronto alderman 1912 – 14; a member of the Board of Education 1921 – 22. His wholesale jewellery business was the largest of its kind in Canada. 1927 Sept.: New building occupied; consisted of “eight grade rooms and an all-day kindergarten”. Ritchie, Don. North Toronto. Boston Mills Press: Erin, ON, 1992. pp 130-133. JNW-PS-a: (WWII) Illuminated list designed by A.J. Casson. “For King and Country / Members of / John Wanless School / who have volunteered for active service / with / Canada’s fighting forces.” Four columns. Surnames followed by given names or initials. Key: red cross indicates “Killed.” List does not specify which war, but date of school opening, presence of one woman’s name, and the use of an A.J. Casson document, indicate World War II. JNW-PS-b: (WWII) Illuminated list designed by A.J. Casson. “For King and Country / Members of / John Wanless School / who have volunteered for active service / with / Canada’s fighting forces.” Four columns. Surnames followed by given names or initials. Key: red cross indicates “Killed in Action.” List does not specify which war, but date of school opening, presence of women’s names, and the use of an A.J. Casson document, indicate World War II.